In mixing bowl, whisk methylcellulose with water. Let it sit for an hour, whisking every 15 minutes. If the mixture develops bubbles, float strips of newspaper on the mixture, pat the newspaper lightly and from one corner, peel the newspaper off the mixture – the bubbles should disappear. Thin your acrylic paint with water. Using a paint brush, sprinkle dots of thinned paint on the methylcellulose mixture in the shallow container. Using toothpicks, cardboard and masking tape, make a comb. Use this comb and/or a bamboo skewer to swirl the paint and create patterns. Float the 100% cotton paper on the swirled paint. Lightly pat the paper to make sure that all the paper is touching the paint. Lifting from one corner, peel the paper from the paint mixture and float the paper, paint side up in a second baking tray filled with an inch of water. Pour a cup of water over the paint to rinse it. 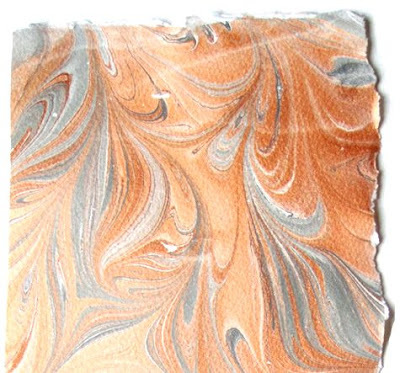 Remove the marbled paper from the water and shake it lightly to remove excess water. Hang the paper to dry on a clothesline or lay it flat. Measure lampshade and trim paper to fit. Pipe hot glue around the top and bottom of your lampshade. Wrap the paper around the existing lampshape. Clip with clothespin until the hot glue has dried. ok - do you realize my favorite gift from John was a handmade book he made for me - marbled. I still own it and will show it to you.